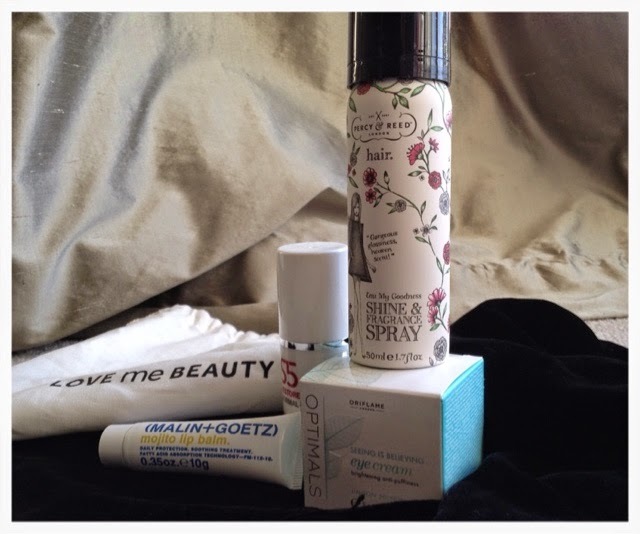 Some Love Me Beauty Box Items ... Reviewed! Does anyone get the Love Me Beauty beauty boxes? This is a Love Me Beauty box that I received a while ago, I think before Christmas, frankly the run up to Christmas was completely mad for me so it's unsurprising that this didn't get discovered until January. Anyway, it's taken me a little while to try these products but I'm finally in a position to tell you what I think of them! I've only recently tried Hair Fragrance because Federico Mahora sell it and I am a distributor for their gorgeous products. Before then if I wanted my hair to smell nice post wash, I'd just squirt a little bit of perfume on it. However specially made hair fragrance is much more than that, these products have got lots of lovely things in them to make your hair shine and feel gorgeous. This Percy & Reed one has got a gorgeous smell, takes away frizz and gives a great shine. You aren't supposed to touch your hair until 30 seconds after you've sprayed, that gives the fragrance time to settle and the oil to dry on your hair. Ah, Oriflame, how I love you. I very nearly worked for them but FM suited me better. I have quite a few Oriflame products and I love them all and this didn't disappoint although to be fair this is the first Oriflame skin care product I've tried, everything else has been make up. I'm sure I am at the age where I'm supposed to be whacking on eye cream every night but I don't, I tend to forget (I'll probably regret it 20 years from now) I find a lot of them very heavy and I wake up with sore eyes which makes me look worse. This is a bit different because this cream is applied in the morning to reduce puffiness and soothe tired eyes. As with most eye creams you only need to apply a small amount using your ring finger. After about 30 seconds of application you can feel a cool, tingly sensation underneath your eyes and it does feel like the skin is tightening and my eyes felt better and less puffy. I don't use it every day, only when my eyes need a bit of help so it should last a while. I would definitely buy this product from Oriflame though, when this one runs out. Good choice Love Me Beauty! I think I've said before I don't have a particular passion for Lip Balm products, mainly because they are usually clear and I like colour on my lips as they are very pale. My favourites usually are the Maybelline Babylips and the Burts Bees one that I reviewed a little while back. However, if your lips are dry and sore this is a particularly good product because when I used it, literally overnight my lips felt so much better. It is quite a thick and slidy balm which is why I probably would only use it at night so that it can soak right in whilst I'm asleep. I wouldn't use this every day, I'd use the Maybelline one for everyday and keep this one for when my lips need a proper boost! This is a cute little handy handbag size moisturising cream from S5. I have fairly dry skin and as this product is for dry skin I was interested to see what this was like. I have to say I felt a bit non-plussed about this product. It was a perfectly nice cream, not thick, sinks in very well but it didn't make my skin feel particularly nourished or very well moisturised. I tried it a few times and each time I didn't feel like it was a good enough base for me to apply my make up, it didn't hydrate my skin enough, it still felt a bit tight so this isn't a product I would be purchasing to be honest. Perhaps I need one for very dry skin (or mature!). My favourite product out of them all is the Oriflame eye cream, I definitely got more out of this one than the others and I would purchase it again. Hi beauties, just had to show you this product and do a quick review, this is such a pretty product, I got it in a Glossybox (I subscribed to Glossybox last June, love them). It took me a while to get round to using this, I think because it's a highlighter and I got it in the winter and I tend not to highlight too much in the winter, I'm too pale but the other week the sun came out and I thought, why not! Since then I've used it pretty much every day and I'll be taking it on holiday in a few weeks as well. The official title of this little cutie is Jelly Pong Pong All Over Glow (Illuminating Gel). You don't need very much, a little goes a long way. I use it as a highlighter on my cheek bones after I've put on my blusher, it seems to help the blusher to last a little bit longer which is great. It's got a very light feel to it, I think because it's oil free, and it's very easily blendable, I used my ring finger but if you prefer a brush that would work as well. What I liked about it most is that it doesn't show up any imperfections, in fact just the opposite, it seems to give the skin a lovely smooth appearance, what's not to love about that? Once this runs out I would definitely buy it, that's the beauty of beauty boxes, you can test and see which products you like and write them down on a wish list if you like them! I've been on the Jelly Pong Pong website and I think I could probably spend quite a lot of money there. 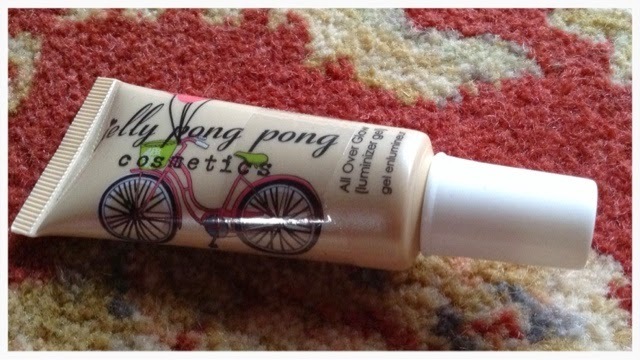 This lovely highlighter can be bought from jellypongpong.com and is £10.00. Well worth it. I couldn't resist these lovely Zoella products from the Superdrug online website the other day. As you all know, Zoella released this range in late 2014 and as usual I am late to the party but better late than never, right? My 13 year old cousin is a big fan of Ms Sugg and we chat a lot about her, I live in a house of males (three little boys, a dog and a husband) so I love it when she comes over and we can chat about YouTube, make up and girly stuff! I'm really impressed with these products, it would have been so easy for Zoe to just fling something together really quickly but it seems to me that she's thought out this range. She's gone down the bath/body product, fragrance and the accessory path rather than make up and she's only released a few products, not loads so there's a quality feel to her range. It's very reasonably priced and you can buy it from Superdrug, a shop we all know and love. I will say that I wasn't overkeen on the Blissful Mistful perfume at first, I think I may have sprayed a bit too much but it's lovely when it wears on and is a great fresh daytime fragrance and one to have in your handbag. The Soak Opera bath and shower creme is gorgeous, has a luxurious feel to it and seemed to last a long time, I used mine mainly in the shower but you do get a good bubble bath out of it too, I also think Soak Opera is a cute name. There's also a choice of three make up bags (though I guess you don't have to put make up in them), I chose Just Say Yes because I think that's quite a good thing to remember! I'm not using it as an every day make up bag but I have stored all my favourite everyday lipsticks in there. While I haven't read her book yet, I would consider purchasing more of Zoe's beauty products, but I do think they are aimed more at her young YouTube fans rather than middle aged women like me. That's fine though, we all have our niche and good for her, I say. I'm sure Zoe has got more up her sleeve and will do really well as she's very likeable and people love her. As long as she keeps her prices quite low these products will fly off the shelves.